Caramel Apple Poke Cake is super simple to make. 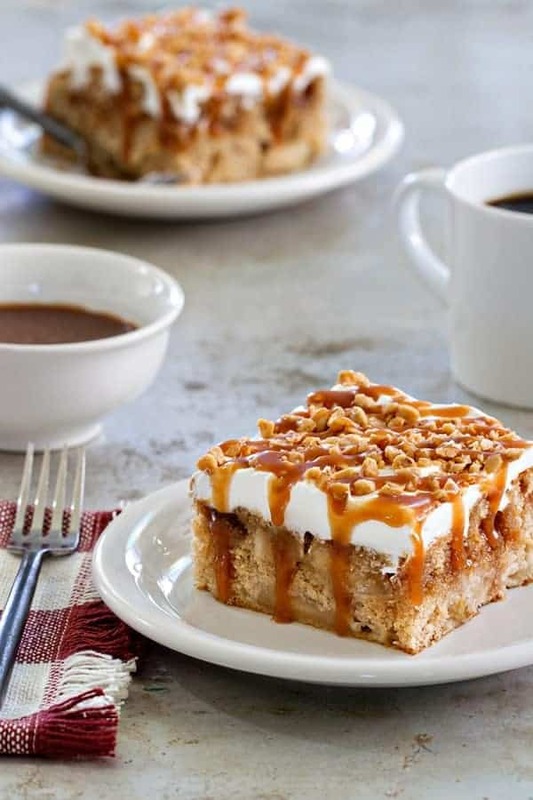 The caramel drizzle and toffee bits make it irresistible. So perfect for fall! I don’t know what the weather is like in your area, but it certainly doesn’t feel like mid-October in Ohio. Even though our front porch screams fall with a festive wreath and more pumpkins than I can count, the weather is screaming tank tops and shorts. I’m totally not going to let 85 degree weather get in the way of fall baking, just fall boot wearing. Because I’m pretty sure I’d look all kinds of crazy rocking my favorite Frye boots when everyone else is wearing flip-flops. 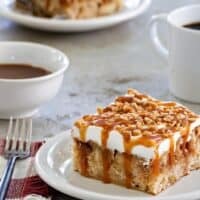 I love this Caramel Apple Poke Cake because it is super easy to make. Just a head’s up, it uses cake mix, apple pie filling and whipped topping, so if you’re not a fan of those things, this cake is definitely not for you, but rest assured, I have a homemade apple cake coming your way next week. If you’re a regular follower of My Baking Addiction, you know that I love baking from scratch, but I also think there’s a place for quick recipes that take a few shortcuts from the store. It’s well known that I love doctored up cake mix, so this Caramel Apple Poke Cake was a definite winner in my book. It starts with a vanilla cake mix (spiced cake mix would also be amazing), then you doctor it up with apple pie spice and apple pie filling. 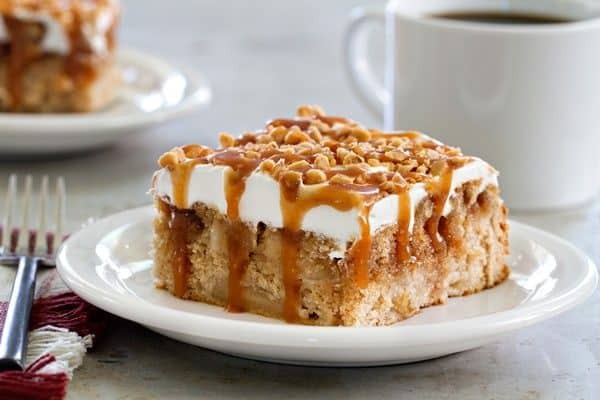 You bake it up to golden perfection, poke holes all over the warm cake and drizzle it with caramel sauce. 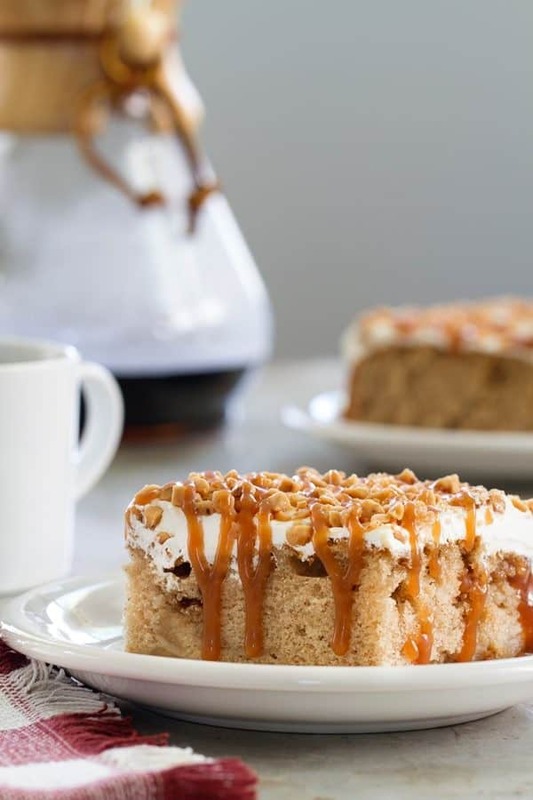 Once the cake is cooled, you top it with whipped topping, toffee bits, and more caramel sauce. Seriously, how amazing does that sound? I’ve made this Caramel Apple Pole Cake three times already and each time it was devoured. Whip it up for a work potluck, a Halloween party, or just a random Tuesday night because it’s that easy! This is really very special and simple at the same time. Everything about this post is so delicate and well measured, with a lot of sense for art. I am sure there is a lot of hard work behind. All the best ! I am drooling over this cake, it sounds so tasty! It sounds perfect for fall! This looks absolutely divine, I can’t stop looking at the photos! I’m in England and it’s definitely not flip flop weather over here anymore, so I’m totally ready for cosy autumnal desserts. I hope you enjoy it, Rosie! Pinned. I need a fall recipe for a party and this works. Wonderful! I hope you enjoy it, Angela! Looks yummy, Jamie! Poke cakes are always so delicious; love how the flavors just permeate the cake! You can’t miss with caramel apple, so this one is definitely a must for fall. So happy to hear you enjoyed the recipe, Clarice. Thanks so much for stopping by and leaving your feedback. It’s fall and apples are in season ! Disappointed to see a recipe for canned pie filling. First recipe from you I didn’t want to try. As I mentioned in the post, this recipe won’t be for everyone, but I have a homemade apple cake with fresh apples coming up next week. Thanks so much for your feedback. I’ve always seen videos of poke cake and never actually tried to make one! This is the perfect time to make one with this recipe and the holidays coming up! If you don’t want to use pie filling just cut up 5 apples and cook them in a frying pan with 1/4 cup butter and 1/4 cup sugar stirring frequently,until apples are tender and add to mix. It turned out great. Sounds wonderful, Jane! Thank you! All I have is a yellow box cake. Do you think that will change flavor? Yellow cake mix will be totally fine. Enjoy! What caramel sauce do you use? Is it the same as you use with ice cream? Hi, Kathy! Caramel syrup for ice cream would be perfect. I hope you enjoy the cake! Making this cake for my bunco group tomorrow! Hope it tastes as good as it looks! Let me know how it goes, Judy! I hope everyone enjoys it! Hi, Sonya! I believe you can get vanilla cake mix from Amazon. I hope this helps! I recently made this cake and it was wonderful. I received many compliments. I followed this recipe exactly, and it was DELICIOUS! So flavorful, moist, and yummy. It was the perfect dessert for a fall gathering, and I received many compliments! Thanks for the delicious recipe! So happy you enjoyed the recipe, Lisa! Thanks so much for stopping by! Happy Baking! If I use a spice cake mix do I still need the apple spice too? I make it with spice cake all the time — between the spice in the cake, and the spice in the apples, I leave out the extra spice in the recipe and it turns out wonderful every time! Hi Jamie, I stumbled on your recipe while searching for a quick fall dessert that I could make to serve with dinner at a local homeless shelter. I’m getting ready to start baking 6 cakes which I’m sure will be a huge hit. Thanks and happy baking! I love this so much, Dee! Thank you so much for sharing and I truly hope they’re a huge hit. Your giving spirit is inspiring. Happy Thanksgiving to you and yours!